Today I‘m lucky to have Bernie Thompson on the show. Bernie runs an 8 figure business called Plugable.com which is a company that sells USB and Bluetooth devices online. Now what’s cool is that his company is global. Plugable sells its products in many different countries all over the world. And what’s also cool is that Bernie built all of his own tools in house to manage his Amazon business named Efficient Era. Now I’ve actually started using Efficient Era myself to manage the feedback for my shop and the tools are really useful. 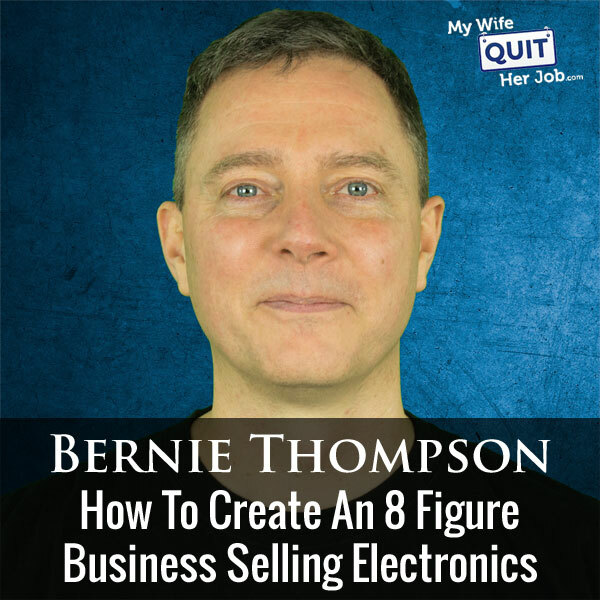 Anyway, the reason why I have Bernie on the show today is to talk about how to be successful selling electronics on Amazon and the exact processes and tools he uses to make money. Enjoy! How Bernie got into ecommerce and what made him choose to sell electronics. Bernie’s strategy for going into new markets. Bernie’s main criteria for selecting products to sell. Bernie Thompson with me on the show. Now Bernie runs an eight figure Amazon business called Plugable where he sells electronic equipment which is quite possibly the most competitive and the most cut throat niche that you can possibly go into on Amazon. He also runs a popular Amazon software service called Efficient Era which allows you to match up your product feedback directly to a specific customer on Amazon. Now I actually use this software and as far as I know it is the only software out there that allows you to do this. In any case Bernie is an amazing guy, and enjoy the interview. But before we begin I want to give a quick shout out to Klaviyo who is a sponsor of the show. Now I’m super excited about Klaviyo because they are the email marketing platform that I use for my ecommerce store, and I depend on Klaviyo for over 20% of my revenues. Now you’re probably wondering why Klaviyo and not another provider. Well Klaviyo is the only email platform out there that is specifically built for ecommerce stores, and here’s why it’s so powerful. Klaviyo can track every single customer who has shopped in your store and exactly what they bought which makes it extremely powerful. So let’s say I want to send an email out to everyone who purchased a red handkerchief in the last week, easy. Let’s say I want to set up a special autoresponder sequence to my customers depending on what they purchased, it’s a piece of cake, and there is full revenue tracking on every single email. Now Klaviyo is the most powerful email platform that I’ve ever used and you could try them for free at mywifequitherjob.com/Klaviyo, once again that’s mywifequitherjob.com/K-L-A-V-I-Y-O. I also want to give a quick shout out to Privy who is also a sponsor of the show. Now what’s also cool is that I use and rely on Privy for both my blog and my online store. Now what does Privy do? Privy is an email list growth platform, and they actually manage all of my email capture forms, and in fact I use Privy hand in hand with Klaviyo. Now there are a bunch of companies out there that will manage your email capture forms, but here is why I like Privy. Privy is easily the most powerful platform that I’ve ever used, and you can trigger sign up forms based on any primer that you desire. So let’s say you offer free shipping for orders over 100 bucks, well you can tell Privy to flash a popup when the customer has 90 bucks in their shopping cart to urge them to insert one more item. Here’s another cool use case, if someone has item A in their shopping cart, I can easily tell Privy to display a special coupon code for that item or display a related item. In terms of email capture, I’m showing different email lead magnet depending on what product a customer is browsing in our store. So bottom line Privy allows me to turn visitors into email subscribers, which I then feed to Klaviyo to close the sale. So head on over to Privy.com/steve, once again that’s P-R-I-V-Y.com/steve, and try it for free, and if you decide that you need some of the more advanced features, then use coupon code MWQHJ for 15% off. Now on to the show. Steve: Welcome to the My Wife Quit Her Job Podcast, today I’m lucky to have Bernie Thompson on the show. Now Bernie runs an eight figure business called plugable.com which is a company that sells USB and Bluetooth devices online. So first off those of you who have followed me for a long time know that I generally advice against going into the electronics business. Not only is there the threat of your products going obsolete but the quality assurance and the [inaudible 00:04:03] required can be very daunting as well. And then you couple that with the fact that China can produce electronic knock offs fairly quickly makes it even tougher as well. Anyway Bernie has managed to create an incredibly successful Amazon business selling USB and Bluetooth devices, and what’s cool is that his company is global. Plugable sells its products in many different countries all over the world. What’s also cool is that he built all of his own tools in-house to manage his Amazon business, and then he decided to take those tools public and his company is called Efficient Era. Now I’ve actually already started using these tools myself to manage the feedback for my shop and they are really powerful. Anyway the reason why I have Bernie on the show today is to talk about how to be successful selling electronics on Amazon and the exact processes and tools he uses to make money. And with that welcome to the show Bernie, how are you doing today? Bernie: Great to see you, great to talk to you. Steve: Yeah so Bernie I know that from your background you used to be a software engineer, how did you go from software engineer to ecommerce? Bernie: Yeah I was a software engineer, actually kind of like you Steve I was a low level kind of guy, so I worked on the device driver layer, so all these hardware devices that we use every day, they have a bunch of software that interfaces between that device and the operating system and that’s what I used to work on and I used to then manage the USB and Bluetooth teams at Microsoft, and that led to creating this USB and Bluetooth devices business. Steve: So why electronics of all things? Bernie: Yeah I think interestingly Plugable is electronics company first and then Amazon seller second, so it really was because we had to go on building a better device company that when I started Plugable in 2009, the experience buying things like USB and Bluetooth peripherals was pretty dismal. They seemed to work most of the time but when they didn’t work you had horrible information and horrible call center style of support. So we wanted to go direct using all of these new capabilities that were coming with Amazon and FBA and the ability potentially to sell globally, and do kind of that information and support in a much different, more customer centric online way with fast feedback loops and doing the right things for customers and getting rewarded with good reviews. So yes Plugable was an electronics business, design is electronics business first and really selling on Amazon was secondary. We really wanted to solve issues that were out there for all the USB and Bluetooth device companies that they really were providing poor support call center style. We saw the opportunity to do it online with better information and a more customer centric approach using all the new tools that were coming in the form of Amazon and the Amazon FBA and it’s worked out pretty well. Steve: So here is the thing, I looked at some of the products on the Plugable website, so for example you sell like a USB hub, but if I go out there is like – I would say there’s hundreds if not even thousands of those out there. So how did you come up with which particular electronic products to sell, and I guess what was the first product that you launched? Bernie: The first product we launched actually was trying to take some off the shelf hardware and use it in a different way. We took USB docking stations which were new in 2009, and were turning them into USB thin clients, and I actually because I’m a software engineer I actually did a bunch of unique work in Linux to make that possible. So we did a unique product as our first product and as it turns out it failed. Steve: Okay and why did it fail? Bernie: It failed because the USB thin client market never took off. Around the same time you started having less and less expensive Windows laptops and tablets, you started having Chrome books a few years in, and so the benefits that you got from taking a single computer and connecting a bunch of thin clients and turning that one computer into many, you’re really looking at mostly a cost benefit there, and that cost benefit people were getting in different ways so just having their PCs being cheaper. Steve: So when you decided to sell this product – I guess what I’m trying to get at is like what is your process for figuring out or making sure that a product doesn’t fail when you bring it to market? Bernie: Yeah, when I first started I thought we would be a single product company. As it turns out that product failed and I faced the choice of, well do I stick with this and keep trying harder in this USB thin client market or do I go wider, and I made the decision to go wider. So at that point it really kind of switched from a mindset of we’re a thin client company to I’ve got to launch a bunch of products in the hopes that one or two of those will be successful. I kind of thought it might be like a five to one ratio or something like that, so almost like a VC mindset. As it turns out in the early years 2009, 2010, 2011 it actually was more like one out of every two was successful, it was a very high hit rate, and we can talk about maybe why that was. And then over the years that has varied a lot starting in 2012, 2013 a huge influx of sellers often from mainland China where most electronic factories are located, and our hit rate went down significantly. Also at that time you started having the review gaming which we never participated in, so we really had a lot of head wins against us because our competitors were launching products and having hundreds of reviews within a few weeks, whereas we took months to get hundreds of reviews. That was a huge disadvantage that we suffered, so recently our hit rate has actually been going up because we’ve continued to refine our processes and now Amazon has cramped down on the fake reviews. So it’s not as good as it was in the early years but we’re probably talking about like a one out of every four products is a hit. Steve: Okay and just to be clear do you design all of your own stuff in-house or you don’t do any sort of private labeling or white labeling of products that are existing, right? Bernie: We do the full [inaudible 00:10:44] from basically products that already exist and bringing the model of the Plugable brand to actually getting involved with a little bit of low level PCB design and other things, but most of our products fall in the middle where we kind of do ground up research. We know what chip sets are coming out from the IC makers and we go out and seek factories that are experienced using those chip sets, and we put in our FQs and try to get them to build a product that uses the chip sets that we’re looking for and has the features that we want. Steve: Interesting, so do they perform all of the testing and everything for you then? Bernie: Yeah we do a lot of testing but really it’s mostly kind of from the user perspective and high level testing, so our factory partners are heavily involved with the low level testing also. Steve: I see so in terms of like schematic design and all that stuff, that’s all handled by your designer? Steve: And are most of your products created over in Asia? Bernie: Yes, the original designs come from all around the world. Most of the designs originally come from the chip set makers; the IC makers from the reference designs and so just as an example of a lot of our products use chips from a company called DisplayLink which is a USB graphics company. They are located in Cambridge England, so a lot of the original reference designs are coming out of Cambridge and then they get picked up by the factories, they modify them to fit a form factor or adjust the cast or adjust our request for features and that’s how the low level design gets done. Steve: So to do what you guys do requires some amount of technical knowledge is that accurate? Bernie: Yeah, I think you said earlier in the call you generally recommend against electronics. Yeah I mean there’s a lot of barriers here, I’ve worked at — and even though I’m a software guy I’ve worked at two chip companies, a chip graphics chip company called S3 in the 1990s. Steve: Yeah I remember those guys. Bernie: I worked at DisplayLink themselves, I was a VP at DisplayLink. So I’ve been able to use this knowledge of how these chip companies work and how the supply chain works to not just be a passive actor, but actually to be an active participant in all these choices that ultimately end up determining whether the product is a quality and whether the product is differentiated from other products that are out there in the market. Steve: Okay and so I’m just curious to achieve your revenues how many product skews do you have and what country are the majority of your sales coming from? Bernie: So we have over 100 products at this point, we have about 110 and by far our leading market is the US. US is greater than all of our other geographies combined although all the other geographies are growing and they are fairly healthy too. Steve: And in terms of skews you mentioned you had like a one in four hit rate, what do you do with the three that fail, do you just kind of discontinue them right away? Bernie: No we don’t discontinue them right away, I mean because we’re doing products that are unique in many cases, will have unique aspects, we’re dealing with relatively large MOQs, minimum order quantities usually 1000 or 3000 at least and so it takes some time. When we do have something that’s not a hit frankly we’re stuck with the inventory for quite a bit of time usually a year or two. we’re saying in our marketing to get that product to take off. It’s funny it’s a lot like starting a campfire or something, sometimes you get a situation where it just fails to light with the few attempts and then just for some reason on the fourth or fifth attempt it lights and that happens with products too. Steve: Okay and then when did you actually decide to expand overseas to other countries? Bernie: It was actually pretty early on. When you’re doing unique products that you’re investing a lot in ahead of time, any market that you’re not in is a missed opportunity. You’re giving oxygen to your competitors by giving them a market that you’re not competing with them in. So we try hard to be as aggressive as we can be to reach every market around the world, although that said we tend to focus on Amazon. So we focus most on the markets that Amazon covers but we do also try to reach the other ones. Steve: Okay so I want to talk a little bit about your product selection process without getting technical at all. What is your main criteria when you decide to bring something to the market, what is your process and what price point and margins do you like to see? Bernie: I think we do with electronics where the Plugable brand we’re connecting this with that, so the number one issue is compatibility, are we able to make a very broad statement that if you have an HDMI monitor that this product will connect your laptop to it or whatever. Very often in electronics it’s not so simple, the compatibility story is inherently complex. Maybe let’s say the product is a DisplayLink graphics product and the drivers on Mac just aren’t that good or the operating system support for DisplayLink is not that good. So we spend a lot of time trying to create a product with the maximum compatibility possible, and then whatever is left just is a limitation. We work really hard to try to communicate that accurately and upfront to the consumer so that they know what will work and what won’t. Steve: So I imagine you have several competitors on Amazon, right? Bernie: Yeah many, I mean literally it’s electronics so we literally have hundreds of competitors. Steve: And so how do you stand out? Bernie: We try to get the little details of compatibility right, and sometimes that’s firmware thing, sometimes that’s a tweet to the hardware, and then we try to get the expectations setting right. Often we have an advantage there because all of our staff is here in the US where actually I used to work in Microsoft here in Washington, and so we got some great technical people around. So we’re able to describe the product more precisely and so we don’t have people for whom the product is not going to work buy it and then write a negative review. So in addition to compatibility issue it’s features. We’re trying to make sure that when we look at all the products in the market out there that we’ve made at least a few choices that move the feature bar forward. Although we don’t focus on price as much as some other people, we want to make sure that at the feature level we’re on that the price is competitive. So there’s really a lot of market research that goes into every product before we launch it. competitive, then it’s a matter of really doing kind of all of our execution right in terms of selling on Amazon and doing ecommerce so that we can drive the Amazon fly wheel and push that product up in search results through proving to Amazon that when people glance at the product they choose to click on it, when they click on it they choose to buy it, and when they buy it they have a good experience. Steve: And I’m just kind of curious what the margins – can you kind of give us an idea what the margins are like for electronics? Bernie: Yeah the margins are really tight for electronics. If you’re able to net out after everything a 5 or 10% that’s probably considered norm. Steve: Wow, okay I didn’t realize it was that low. Bernie: Yeah that’s after everything, support and everything. Steve: Sure of course yeah, and in terms of the time frame from inception to getting a product ready to go to sell what is like a time frame for a typical product of yours. Bernie: We try to make it as short as possible. When you’re producing custom product that is being manufactured in Mainland China there is just inherently some fairly long latency, some long delays. Even on a product that is settled that we’re just doing a reorder the delay is anywhere between two to four months depending on chip set availability. So for a new product it can be as long as nine months but we try to get it down to maybe four months or so on a new product. Steve: Okay and then typically like what’s like a minimum investment for like the first purchase? Bernie: It depends on the cost of the product. Bernie: We sell products that are $200 docking stations and we sell products that are $10 cables. So if you kind of multiply out a wholesale cost on that by 1,000 or 3,000 units plus the bunch of time invested, you’re usually talking about a minimum of tens of thousands of dollars on a new product. Steve: Okay, all right so let’s switch gears away from the actual product design, because I’m pretty sure like the actual product development is probably a little too technical for anyone who is listening even though I would be personally interested in all that stuff. Bernie: Right yeah you have all the background for this. Steve: Like trying hard not to ask you those questions right now. All right so you got your product, you’ve sent it over to Amazon, so what is your strategy for getting it visible on Amazon. So let’s start from the beginning like it’s got no reviews, what is your strategy for launch? Bernie: You know it’s so tough – even when we started and certainly now here in 2017 if you launch a product on Amazon it could be the best product in the world at the best price, and it will sit there at the bottom of search results and no one will buy the damn thing, so strategies are absolutely necessary. So let’s talk in terms of the funnel because I think that thinking of a funnel is the correct way to think about this. So our first challenge is to get anybody to go look at the product at all regardless of what their reaction will be to it. And so our strategies for doing that are number one is content marketing. Every product has a story, every product has a reason for existing, every product has problems that it’s solving. There are people out there who are having those problems, who are having those frustrations who if they were aware that there was a solution they would be excited about it, so our job is to reach them, this is marketing. The only thing that’s changed about marketing is video is so much easier now because we can use tools like posting videos on YouTube and posting videos on Facebook and we can use targeted marketing on Amazon, on Facebook, on Twitter, on Google honing in on the searches and the keywords and the interests of customers. So our first job is to break our product down into what are the problems it solves, what are the customers who would be interested in that kind of problem and solution and then what are the keywords that are relevant to them and what’s the content that would be compelling for them, often the videos, sometimes blog posts, sometimes maybe a cross post or an article on another site and creating hat content. Steve: So you’re creating content and I think in the case of Plugable you guys do a lot of how to type of videos, or feature videos? Bernie: It’s kind of interesting, with electronics it’s hard but there’s a lot to talk about because there’s a lot of how to and a lot of interesting new things that is sometimes possible with technology, so yeah so we use all of those excuses to create some – tend to create some compelling content. Steve: So you have the content but how do you get people to actually look at it? Bernie: So a lot of it is patience, that building an audience takes a lot of time, there are so many gigantic problems with ecommerce, we talked about how you launch a product on Amazon and it sits at the bottom of search results and nobody finds it. That is true for your content too; until you’re able to build up an audience, it can be frustrating. You can have a very compelling video sitting out there on YouTube and no one will go view it. So a lot of it is really about pushing a snowball down hill and having the patience to have that snowball build in size. Today Plugable has over 8,000 YouTube subscribers and we have several million video views on YouTube. It took eight years to get to those numbers, and so there is a bit of that is that planning and setting aside your time and your budget to give yourself enough time to have that snowball build some size and become self reinforcing in the end. Your past content is in a sense creating the audience that is going to be viewing your future content. Steve: So I’d like you to take me back to your first successful product like when you had nothing, and were you doing content well before the launch of the product? Bernie: Yeah we had the content strategy from day one, so if I would look back at the plugable.com site right now I could find blog posts from the fall of 2009. At that point we figured we were trying to reach the most dedicated possible audience for our products, so we focused on very tactical blog posts that would really get a core group of people very excited about what we were doing. I also was speaking at conferences about the product and I was trying to reach that same sort of audience. So I guess there is a lesson there in terms of being realistic about what audience is likely to be excited about you, and even though ultimately you want to reach a wider audience, first focus where you’re strongest and establish some momentum and some credibility where you’re strongest and then kind of build on that and expand on that. Steve: I just want to take a moment to thank ReferralCandy for being a sponsor of the show. Now for any ecommerce store word of mouth is huge, and when a customer is super happy with their purchase they will tell all of their friends. Now what if there was a way to amplify word of mouth about your company, what if there was a way to reward referrals for your business? This is where ReferralCandy shines, with just a couple of clicks of the mouse; you can add a referral program to your ecommerce store and reward your customers for telling their friends about your shop. Okay so you advice anyone who is launching a brand new product from complete scratch to start thinking about their audience and start producing content for that audience? Bernie: Yeah I would say so. There’s strategies that don’t involve content marketing and certainly actually there’s a lot of successful Amazon businesses that don’t do content marketing. But I think that there is a fragility to that, that the content marketing because it is a snowball that rolls down a hill and grows, it creates a more sustainable momentum for your brand and your products that even though it’s sometimes painful to get that rolling to start with, ultimately it’s what can build a strong, large and sustainable business. Steve: So in terms of the sales of your first successful product then, was it Amazon customers that were browsing the marketplace, or were they people that you were driving either through email or your content to buy that Amazon product? Bernie: So on the first product which was a unique USB thin client product, it was mostly us driving people to Amazon and I think even the terms that people would think to search for if they were looking for such a product weren’t very clear. And then as we expanded our product line, we went into very well understood commodity areas like USB hubs and USB keyboards and mice and USB graphics adaptors. In those areas there was an existing body of people on Amazon already searching for those products, and then we just needed to focus on coming up high for those searches that were already happening. Steve: Okay so essentially kind of using your terminology like the fly wheel going, right? Bernie: Exactly, so we talked about kind of filling the top of the funnel with content marketing. So then the next step – and this is somewhat what’s unique about Amazon and powerful about Amazon is Amazon is really using and looking at using all the metrics about your products. Amazon’s philosophy is very customer centric, they want customers to have great experiences on Amazon, and they want to help that to happen through data. So they want to reward products on Amazon that when somebody is driven to the Amazon site for whatever reason or searches on the Amazon site there is a product that they are attracted enough to click on. Then when they click on it that there is a high percentage of the time that they buy that product, and then when they buy that product that there is a high percentage of the time that they a have a good customer experience. So Amazon is literally taking those metrics, those conversion metrics for your product and feeding that back into the search results. So it is a fairly beneficial kind of feedback loop of if you do right by customers on Amazon, Amazon will reward you with a higher position in search, and so a lot of the focus of our business has been on making sure that that customer centric feedback loop is spinning the Amazon fly wheel and driving sales. The final part of it is that when that feedback loop is working and you’re getting pushed up in search, well that results in more sales which results in more statistics which reinforces that hey this product is a good product that is increasing its sales. So that’s how you kind of get this fly wheel effected, and in fact if you can push your product up in the Amazon search to where it is one of the top sellers and people are having good experiences with it, it’s very self reinforcing and it’s actually hard for competitors to knock that product out of that position except by slowly growing there with a better product and better experiences for customers. Steve: So can we talk about some of your specific processes that you use for Plugable to kind of push this fly wheel and get a positive feedback loop going? Bernie: Yeah absolutely, so a lot of the really successful sellers who started earlier on the Amazon platform and I have met a bunch of them – it’s interesting a lot of us were software developers, and part of the reason why that happened was Amazon provides a lot of tools for sellers, but they don’t do all of the essential things. So a big part of making sure that the feedback loop goes well and that the fly wheel is spun is identifying all loop wings in all these things that happen on Amazon where communication with the customer or being very fast to respond to things that are happening with Amazon will help produce better experiences. So one of the early things that I did in 2010 was begin developing software that for example every time an order shipped from Amazon FBA I would send out an email to the customer that had a bunch of helpful support information, and also establish a rapport with the customer and said that after you have a chance to use the product for a while we’d love to have a product review with your experiences. So at this point here in 2017 is great because there is actually a lot of services that will do that for you, you don’t need to develop software for it, and we’ve actually now taken all the software that we developed for Plugable and made that available on efficientera.com, so we’re one of those services too. So that was the key thing is establishing contact with the customer. Steve: Can we talk about your email flow like how many emails are you sending out? Bernie: Yeah so we’ve had a philosophy from day one that we don’t want to annoy customers by sending them multiple emails, so it was actually interesting when we created Efficient Era and took our internal system and offered it to others because other competitor tools allow you to send multiple emails for a single order. So we went ahead and did that in Efficient Era, but Plugable still to this day does not use it. We send out a single email that is more about customer service than it is about asking for a review, and we send it out when the item ships so that the email will arrive right before the product does, that’s how Plugable does it. We have a heavy support component with all of our products because we’re connecting this with that and when something goes wrong, it can get complex about why is something not working. So customer support is a huge part of how we can mitigate negative reviews or avoid negative reviews and encourage positive reviews through good experiences. Steve: So from what I understand then you are not actually sending out a review link in this email then? Bernie: We do actually send out review link but we qualify it with after you’ve had a chance to use the product for a few weeks. Bernie: Yeah it’s an interesting middle ground. I know a lot of our competitors would break those two up, they might send a support email when the product first ships and then send a review request email a few weeks later and our system supports that, but I know we still are sticking to this thing of it’s not in the customer’s interest to receive multiple emails per order and we don’t want to be annoying, so yeah it’s interesting. Steve: So they actually have to remember to go back to that email then to leave a review, is that right? Bernie: Yeah that’s right yeah. Steve: Okay, I know for electronics because one of my friends sells electronics that often times they are quick to a negative review if something doesn’t work. Steve: And so when you’re dealing with them on the phone – you have phone support, right? Bernie: We actually don’t, we only are online support, and that’s one of the reasons why we send that email because we want to say in that email, you can contact us by email just reply to this mail to contact us. Steve: Okay do you ever – like once a successful support email has been sent out do you send them a review link then? Bernie: Yeah we may or just generally encourage it, because we do want to treat every customer service incident as an opportunity to avoid a negative review and if we’re able to provide a really positive experience or better experience than maybe they’ve had before we get an opportunity for a positive review. Steve: Okay, I’m just curious so how do you deal with negative reviews like what is your strategy? Bernie: Our strategy is just simply to treat them as a customer service incident. I think in electronics that is a little easier to take that philosophy because usually they just have a simple goal of getting two things to work together, and so either that’s working or it’s not. So when somebody writes a negative review and that’s one of the things that is tough that Amazon kind of makes it tough for you, a negative review is usually just kind of a request for help in a sense. They’ve had a bad experience and at least in our world a lot of times they could have had a good experience if we had had an opportunity to help them. They often jumped to a negative review before they even contacted us for service, but Amazon doesn’t really provide a good way to contact the customer, really the only mechanism you have is to post a comment on their review. Unfortunately the reviewer is often not notified that that comment is there, and it’s really not an appropriate place to have a customer service interaction where you have to exchange information back and forth. So one of the things our tool does is it digs through all of your orders as a seller and all of the reviews and is able to do a buyer review matching so that when you have an Amazon verified purchase that came from your seller account, we’re actually able to send you an email and we do when you get a negative review, and it has the Amazon order number that that review came from. So now once you have that you can just take that link to seller central and contact the customer. So we get that notification for every single negative review that happens on any of the Amazon geographies around the world and those go straight into our customer service ticketing system, and we just try to help the customer and turn that situation around. Steve: So how do you get them to kind of retract their review? Bernie: Well we’re not pushy about it; in fact Amazon terms are clear that you can’t be pushy about it. We focus first on just trying to – whatever was in the review that caused them to have a bad experience, our focus is very clearly just on trying to solve that problem. Then once we’ve solved that problem we will often say something like, oh that’s great, it’s working now, if you have a chance to update your review we’d really appreciate it, or something like that or if you have a chance to write the full experiences up in review we’d really appreciate it. We really leave it at that and we don’t do follow up mails, we don’t do pesters, and I think in most cases the person who is angry and created that negative review because they were having a good experience in most cases they are so happy to have that problem solved that they’re really in a mindset at that moment that they do want to have that be reflected in the reviews. So we get a really good response rate even on that light and very customer oriented guidance. Steve: And incidentally for everyone listening out there, this is actually the main reason why I’m on Efficient Era, the fact that you can actually find out who left the review and then contact them directly is actually a huge boost for customer service, because when I think about how I run my own business like we contact customers who are unhappy right away, and the sooner you do it actually the better because they start fuming and it builds up over time. Bernie: Yeah and we’re able to get that email to you as a seller that there was a negative review and what order it came from in less than 24 hours from when the review was posted, and then on the Plugable side when we are the users of that ourselves we try to get back to the customer within 24 hours of getting notified. So basically in a relatively short period of time the customer gets contacted back with an apology and an offer to help. Steve: Okay so it sounds like the way you run Plugable is with a strong focus on customer service, right? Steve: Are there any other things that you have done to accelerate your Amazon sales? Bernie: Well there is a lot of – the main event for interacting with a customer is the post order email and then responding to reviews. There is also a bunch of other smaller but important events. For example one is Amazon will send you an email when you receive a return or question from customers. Very often customers will tend to not write a negative review until they have the money back and then they’ll write a negative review. So you have a time window there to also treat that as a customer service incident and offer to help solve whatever problem is leading to that return request, so that’s another thing that Efficient Era does is it captures those events and turns those into customer service requests for you. Steve: Have you had success like turning around a return request? Bernie: Yeah absolutely, and it’s sometimes in the form of they haven’t actually sent the product in yet and we’re able to get the product working. Other times it’s just simply – well if it’s a product that the reviews are really critical to us right now like let’s say it only has a few reviews, we might actually do something like, well we‘re sorry you had a bad experience, we really want to understand what went wrong here, we’re actually going to send you a free unit and work with you to get that working just so we can understand what happened here. And of course that’s very much in the customer’s interest, the customer is getting the return and the refund of the product and they are getting the product they originally tried to get working. That happens in our space, sometimes compatibility is complicated and we really are in the dark about why something is going wrong and in a sense that customer is helping us to understand something that may also impact other customers, so in our minds between the review and between learning it’s worth it to us to work with this customer and try to figure out what went wrong. Steve: I see and then by doing that I would image no negative review is ever left when you’re just giving away units, right? Bernie: Yeah if the person hasn’t submitted a negative review yet, they want to see how it all resolves. I mean if they have your engagement, very few customers are going to write a negative review while it seems like you’re honestly trying to help them, because it might work out still. There are some people who are just in a negative frame of mind that they’re going to write a negative review no matter what, but that’s the minority of customers. Steve: And in terms of just boosting your sales, do you guys ever use like discounts or lightening deals or anything along those lines? Bernie: We do, not heavily though, a lot of our competitors in electronics use like deals and best deals very heavily. We have more of kind of an everyday low pricing and fixed margin model for our products, so if we’re doing a lightening deal we’re probably losing money on each unit. So especially now as of this fall Amazon has moved to a system where lightening deals have to come from an approved list that Amazon reflects back to you, and each lightening deal has a cost associated with it, $150 currently. There is only a limited number of circumstances for us where lightening deals make sense, so actually it’s really not our primary means of getting the fly wheel started on Amazon. Steve: Okay and how do you guys manage inventory like how do you know how much product to order, do you systems in place for that. Bernie: We do, they are actually not part of our Efficient Era tools right now; they might be in the future. There are actually today a massive number of spreadsheets with a lot of scripting between them, so we basically have a custom in-house inventory system that tells us that current run rates, how many weeks of stock do we have left, because it’s hard. We’re trying to steer a ship that a decision we make today has its impact three or four months from now because basically if we order one product from our suppliers today, it can be that long until we receive it. So it really feels like you’re steering an ocean liner at times, and it’s very hard to make those forward looking decisions, so we have a lot of analysis around that. Steve: What about tracking your revenues and like your inventory like when Amazon loses some stuff, how do you manage all that stuff? Bernie: The Efficient Era tools do have a functionality in that area, we basically have time series graphs that allow you in aggregate for your whole account and for each product to be able to see the graph of your sales and your inventory over time so that you can see when inventory has been dropping when you’re making that decision about whether to place a purchase order. Amazon is kind of good about giving you data in numeric form for right now, but sometimes that data is deceptive. You might have had just in the last week or two this massive sales spike and then you think – and so you’re looking at your stock you’re going, oh no I’m down to five weeks of sales, but if you look at it in a historical context you might realize that that’s way off the normal trend for this product and I need to be careful and wait for a few more weeks of sales data to confirm the new trend. So we try to use that historical perspective on our sales and our inventory levels to make better decisions. Steve: Okay and I have to ask this question, I noticed on your site that all links point to Amazon. Is there any reason why you don’t take orders on your own site? Bernie: Yeah it’s a tough decision because it’s scary to be so dependent on Amazon and even though we’re an electronics company first and an Amazon seller second we are very dependent on Amazon, and it’s because we’re so good at Amazon, we focused on that and Amazon has really been eating everybody else’s lunch. That said we’ve tried every other ecommerce service, we’re really on Jet, we sell on Wal-Mart, we sell on eBay but basically if you’re trying to do your own sales on your own ecommerce site, the fly wheel has a lot of resistance. Yes you can build a brand and get people to think about your brand first before they buy a product and come to your site, but boy is that hard. Unless you’re a GoPro or you’re a Dell, chances are you’re going to have a very hard time getting that particular fly wheel spinning. More likely people are going to buy past your site and head directly to Amazon and start searching in. So our philosophy has been to be really stuck about that, that there is too much friction on the fly wheel for us to have people think of Plugable first, so we’re going to focus on driving those sales to Amazon and pushing Amazon fly wheel for our products. Steve: So in terms of your content marketing efforts, are you gathering customer data, email addresses and that sort of thing? Bernie: We do a bit; we’re actually not heavily into that and again our philosophy of not pestering customers. We don’t actually have email marketing that goes out other than if people kind of very proactively subscribe to our blog with their email address, yeah so we have not used cold email marketing actually at all. Steve: Okay interesting and do you do any paid advertising? Bernie: We do lots of paid advertising and it’s very focused on that breakdown we were talking about earlier of customer segments, why they will buy the product, what they’re searching on, and we spend that marketing money on a mix of Amazon, and Facebook and Google and really a lot of online channels so that when people are searching for something, that our product is a solution for that, that we’re trying to get our product up in front of them. Steve: So what’s the plan moving forward, I understand that Plugable uses Efficient Era for all of their processes, like you’re eating your own dog food essentially? Steve: And so what is the future, like are you focusing efforts on Efficient Era, are you focusing efforts on Plugable, what is the game plan going forward? Bernie: So all the tools that are in Efficient Era were originally created just internally for ourselves, in fact let me not — I personally did most of the tools in the early years and then started having to build a team as the tools got more and more complicated. So kind of hit the point where wow this is a huge competitive advantage for us, but if we just keep it to ourselves, we’re investing all this money for just one Amazon business when these tools would be useful for many and we could kind of amortize the costs, pretty large costs of developing these tools across a lot of businesses. So we made the decision to spread it out and give up our competitive advantage and offer it to other people. And so now at this point they’re really independent businesses, it’s kind of nice because we have a big in-house customer Plugable who helps guide the feature set and make sure that it’s really relevant and that it’s solving problems for Plugable, and that it works every day without fail. Then on the Efficient Era side we now have over 200 companies that are using it and they are getting all the benefits from it, and we’re able to kind of amortize our cost of keeping the software moving forward across all those businesses. Steve: Yeah I mean there is a lot of annoying things about selling on Amazon; like I just looked at my listing the other day and I noticed that Amazon inserted a bullet point for me. Steve: Stuff like that happens; does your software monitor that tuff too? Bernie: It does, those features are actually just coming out right now. Steve: Oh they are okay. Bernie: We have a listing monitoring notification service, so we’ll send you emails if any of the key fields of your listing change, we’re calling the Amazon APIs and also looking at the page and notifying you of discrepancies and changes. We’re also doing a lot of stuff now with sales notifications where if any of your products hit a new record sales for this week we’ll notify you about that, because that might also be interesting or factor your decisions with purchase orders. So yeah all of those things where Amazon’s own seller central tools are not doing it for you, we’re trying to automate as much of that as possible. Steve: Cool Bernie, hey I appreciate your time for coming on the podcast today and just giving us a glimpse into what it’s like to sell electronics online. If anyone has any questions for you or maybe just want to check out your tools, where can they find you? Bernie: Just email me at Bernie@efficientera.com and of course visit efficientera.com, we’ve got a lot of content up there. Steve: Cool, well hey Bernie thanks a lot for coming on the show, I really appreciate your time. Bernie: Oh appreciated Steve, thank you, bye. Hope you enjoyed that episode. Bernie is actually one of the few people I know who has been able to make a profit selling electronics, and I love the fact that he developed his own software Efficient Era to help his own Amazon business. So definitely go check out Efficient Era to manage your feedback if you end up selling on Amazon. For more information about this episode, go to mywifequitherjob.com/episode157. And once again I want to thank privy.com for sponsoring this episode. Privy is the email capture provider that I personally use to turn visitors into email subscribers, they offer email capture, exit intent, and site targeting tools to make it supper simple as well. I like Privy because it is so powerful and you can basically trigger custom pop ups for any primer that is closely tied to your ecommerce store. And if you want to give it a try it’s free, so head on over to privy.com/steve, that’s P-R-I-V-Y.com/steve. I also want to thank Klaviyo which is my email marketing platform of choice for ecommerce merchants. You can easily put together automated flows like an abandoned cart sequence, a post purchase flow, a win back campaign, basically all of these sequences that will make you money on auto pilot. So head on over to mywifequitherjob.com/Klaviyo and sign up for free, once again that’s mywifequitherjob.com/Klaviyo. I have a question about using Aweber as my email provider, is that okay and will it work?